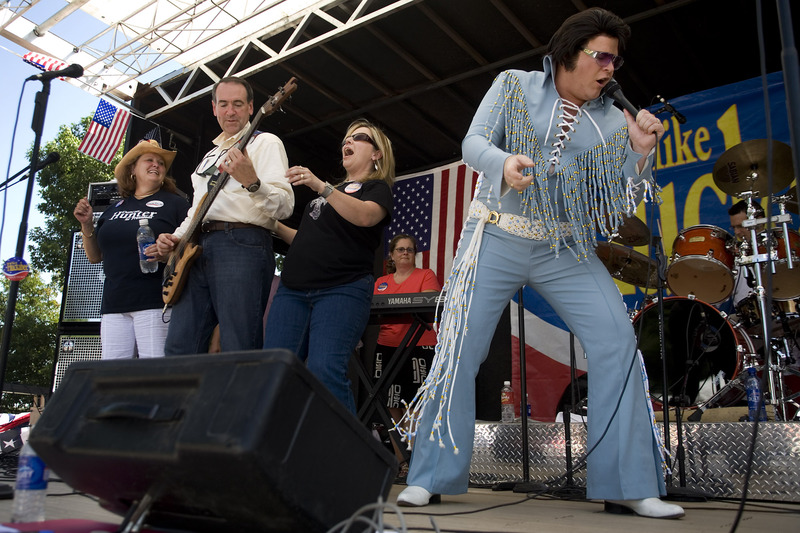 Former Arkansas Governor Mike Huckabee, second from left, plays with his band, Capital Offense as an Elvis Impersonator from Duncan Hunter’s campaign helps out with a rendition of Johnny-Be-Good at the Iowa Straw Poll in Ames, Iowa, on Aug 11, 2007. Huckabee’s Credentials: It sounds like a recycled campaign ad from 1992 — a governor from Arkansas who was born in a little town called Hope who wants to be president. Yes, Mike Huckabee does share a hometown and some of the same political experience as former President Bill Clinton. But while Clinton became the hope of southern Democrats back in '92, Huckabee's own hopes in 2008 are pinned on Republican conservative support, particularly from the party's evangelical Christian wing. Huckabee started out his career at the pulpit. An ordained minister, he was pastor of several Southern Baptist churches in Arkansas. He was also president from 1989 to 1991 of the Arkansas Baptist State Convention and also headed a religious-based TV station. His first foray into secular politics was a loss in 1992 to incumbent U.S. Sen. Dale Bumpers, an Arkansas Democrat. But Bill Clinton's win in 1992 actually helped Huckabee. Clinton's move to the White House, led to Lt. Gov. Jim Guy Tucker moving up to be Arkansas' governor, leaving an opening in the lieutenant governor's spot. Huckabee won a special election in 1993 for lieutenant governor, making him only the second Republican since Reconstruction to serve in that office. He was re-elected in 1994. Tucker, who was later convicted of a felony in the Whitewater scandal, resigned and Huckabee moved into the governor's spot in 1996. Huckabee was elected to his first full, four-year term as governor in 1998 and to his second in 2002. In 2005, Time magazine named Huckabee one of the five best governors in the country. Time noted that Huckabee initiated ARKids First, which offers health insurance to poor children. Time also noted Arkansas' welfare rolls dropped by nearly half since Huckabee became governor and that the state's economy grew by 4.4 percent, beating the national average of 4.2 percent. The magazine said Huckabee had matured into a "consensus-building conservative" and even earned praise from liberal Democrats. Huckabee also scored a personal victory with his health. After being diagnosed as overweight and diabetic, he lost 110 pounds through diet and excercise, which included running marathons. Place of Birth: Hope, Ark. Home: North Little Rock, Ark. Experience: Governor of Arkansas, 1996-2007; lieutenant governor of Arkansas, 1993-1996. Notables: Class president of his high school in 1973, Huckabee went on to college and seminary school to become a Baptist Minister. Diagnosed with diabetes in 2003, Huckabee lost 110 pounds in the following year. Huckabee on the Issues: A look at where Huckabee stands on the issues and how he has voted. Nevada Contributions: A breakdown of Huckabee's financial contributions from the Silver State. State by State Contributions: A breakdown of Huckabee’s financial contributions across the U.S.
Huckabee's MySpace page: Read Huckabee's profile information and leave a message. Huckabee's Facebook page: Read Huckabee's profile information and leave a message. Huckabee Flickr page: View Huckabee's photos from the campaign trail. Huckabee's YouTube Videos: View Huckabee's latest campaign videos. Huckabee's Blog: View Huckabee's official campaign blog. Campaign Manager: John "Chip" Saltsman and more key people.